Tiki Wonders is a lovely Hawaiian themed progressive jackpot slot from NetEnt. Set against the exotic Honolulu beach, this 5 reel 30 payline game is filled with wilds, free spins, multipliers and most importantly 2 progressive jackpots. Although it’s one of the smaller jackpot games from NetEnt, both of the jackpots in Tiki Wonders are progressive and are networked to the Icy Wonders and Geisha Wonders games, so the prize often snowballs very quickly into a lucrative amount. Average win is around £100k, so even though it might not make you a millionaire overnight, a Tiki Wonders win is still very sweet! Give this game a spin at one of these friendly and trusted online casinos. To set your bet size in Tiki Wonders, begin with the Coin Value, which starts at just a penny. Then just the number of lines you want to bet on via Bet Lines. Then there’s the number of coins you want to bet on per line via Bet Value, which goes from 1 to 10. If you really decide to play just the very minimum, it’s just £0.01 a spin, but we do recommend betting on all 30 lines to up your chances of winning. This would make it £0.30 a spin. As a shortcut, pressing the Max Bet button will change your bet to to all 30 paylines at the highest Bet Level, without changing your coin value. To win the Tiki Wonders’ jackpot, you have to spin at least 4 stars on an active payline. This will get you the smaller Wonder Jackpot. Spinning 5 stars on a payline will get you the much coveted Mega Wonder Jackpot. The stars can come any time and you don’t have to enter a bonus game in order to win either one of the jackpots. However, NetEnt does say that higher bets will increase your chances of winning. That’s one of the reasons why we definitely recommend betting on at least all of the paylines – and if you can afford it, at a higher bet level. Both of the jackpots in Tiki Wonders are progressive, and are linked to NetEnt’s other Wonders jackpot games: Icy Wonders and Geisha Wonders. Players playing any one of these 3 slots have a chance of winning the same jackpots. Scatter Free Spins: The Hula Dancer Scatter symbol can deliver a round of free spins with multipliers on top of coin wins. Spin 3 of the dancer symbols and you’ll be rewarded with 10 free spins, and a nominal 2 coins to your bankroll. 4 dancers will get you 50 coins and 20 spins, while 5 dancers will get you 400 coins with 30 spins. During all of the free spins, wins are always boosted with a 3x multiplier. Wild: The Tiki Surfer Wild symbol substitutes for all other symbols to help you form winning paylines. It works for all symbols except for the Scatter and Jackpot. Additionally, from 2 Wilds upwards, you’ll also get a coin payout, which ranges from 2 to 10,000! This game will transport you to the easy life of relaxing in the sun, on a calm, private sunny beach, with drinks of your choice. Even though this is one of NetEnt’s older slots from 2007, the design has stood up to the test of time, and it still feels modern and clean. It’s colourful and the light music adds to the tropical mood. 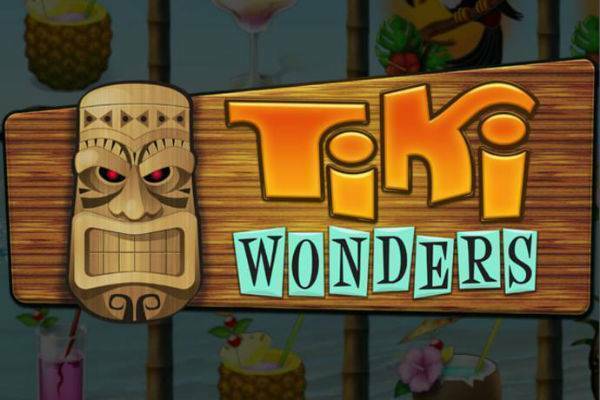 A relaxed, sunny and cheerful slot, Tiki Wonders is a pleasure to play. But of course, it’s not just about its attractive theme. This is one of NetEnt’s progressive jackpot games, and it’s linked with the Icy Wonders and Geisha Wonders. Although its jackpot sizes are compared to Mega Fortune or Arabian Nights, Tiki Wonders pays out more often and a win could still land you a cool hundred grand. No wonder there’s still a strong following to this game more than after a decade since its release! See why so many players love this game at one of these recommended online casinos.